a book chick: "Being Mortal"
my take: At first I thought to recommend this to doctors, nurses, people over, say, 70 years ... and then I realized: it's a read for everyone who is MORTAL. Seriously. A very important read. For you. The book is the very necessary look at how we die in the United States -as in how the medical field helps us or hurts us in making choices at the end of life. It's full of facts and poignant personal stories of the author's wife's grandmother and his own father in addition to many people he met through his surgical career or interviewed for this book. These stories make the book oh. so. human. I cried more than once. Dr. Gawande is willing to shine a light into a part of life we'd rather not see, experience, or even think about: the housing of the elderly and the waiting to die. Through his research, he became able to help his patients and himself ask the questions that make the most of living when a terminal illness has been diagnosed or recurs. The book offers great advice for thinking about how you and I want the last years, months, days, hours of our lives to be - a search for anything to keep us alive (at all costs: financial and quality of life) or the best practices for being fully alive while we are. Informative, scary, hopeful, heartbreaking, surprising, practical - I went on an emotional journey reading this. I hope my parents and in-laws will read it so we can navigate their eventual ends the way they want - and I now can begin to discuss with my children what I want to happen for me in the event of a bad diagnosis or accident. Yes, it's morbid. Yes, we'd rather think about living on indefinitely. And, no, that's not going to happen. You're mortal. I'm mortal. my source: Doctor son-in-law and doctor Hubby have read most of his other books and I haven't - started here. 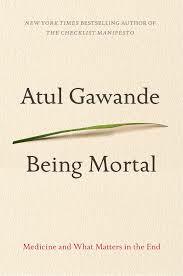 Dr. Gawande is an excellent writer, so I will be seeking out more of his work. my verdict: excellent read. must read. will be among my top picks for 2015. Wow! I will definitely read based on your recommendation. Yes, one of Peter's two man crushes (the other being Malcolm Gladwell of course). I thought the interviews I heard with Atul Gawande on NPR when the book came out were so good, so I had already put it on my list, but I will break my usual no-non-fiction policy and actually get around to reading it after seeing you're going to have it as a top book of 2015!